Murtaza Shibli was born and brought up on the Indian side of Kashmir. He has worked as a journalist, security consultant and aid worker. As a journalist he has interviewed scores of resistance guerrilla leaders in Kashmir including some Afghan jihad veterans. 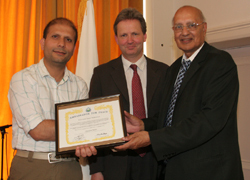 In his most previous job he was Public Affairs and Media Officer of the Muslim Council of Britian. He is the editor of ‘7/7: Muslim Perspectives’ that reveals the experiences of Muslims in the aftermath of the July 7th 2005 tragic suicide bombing in London. As a five year on review it has allowed the reappraisal of the victimisation of the Muslim community by parts of the UK press. He is currently working on a music album in his mother tongue ‘Koshur’.